The control of stormwater on a golf course is more than just preventing the flooding of the clubhouse, maintenance sites, and play areas. Proper management of stormwater controls the amount and rate of water leaving the course, controls erosion and sedimentation, stores irrigation water, removes waterborne pollutants, enhances wildlife habitat, and addresses aesthetic and playability concerns. Stormwater runoff (also called surface runoff) is the conveying force behind what is called non-point source pollution. Non-point source pollution is caused by water moving over and through the ground, picking up and carrying away natural and human-made pollutants, and finally depositing them into surface waters (lakes, rivers, wetlands, coastal waters) and groundwater. On golf courses, pollutants that might be found in surface runoff include, but are not limited to, pesticides, fertilizers, sediment, and petroleum. Treating stormwater to avoid impacts to water quality is best accomplished by a treatment train approach in which water is conveyed from one treatment to another by conveyances that themselves contribute to the treatment. These treatments include source controls, structural controls, and non-structural controls. Source controls are the first car of the BMP treatment train. They help prevent the generation of stormwater runoff or the introduction of pollutants into stormwater runoff. The most effective method of stormwater treatment is to prevent or preclude the possibility of movement of sediment, nutrients, or pesticides in runoff. The next car in the treatment system is often structural controls, which are design and engineering features of the course created to remove, filter, detain, or reroute potential contaminants carried in surface runoff. Examples of structural BMP include ponds, constructed wetlands, and filters to address water quality, water recharge, and stream channel protection. Non-structural controls mimic natural hydrology and minimize the generation of excess stormwater and include vegetated systems. Vegetated systems such as stream buffers act as natural biofilters, reducing stormwater flow, removing sediments from surface water runoff, and preventing nutrient and pesticide discharge in runoff from reaching surface waters. The treatment train approach combines these controls, as in the following example: stormwater can be directed across vegetated filter strips (such as turfgrass), through a swale into a wet detention pond, and then out through another swale to a constructed wetland system. During any construction or redesign activity, proper erosion and sedimentation control must be followed (as discussed in the “Planning, Design, and Construction” section) to ensure that stormwater runoff does not impact water quality. 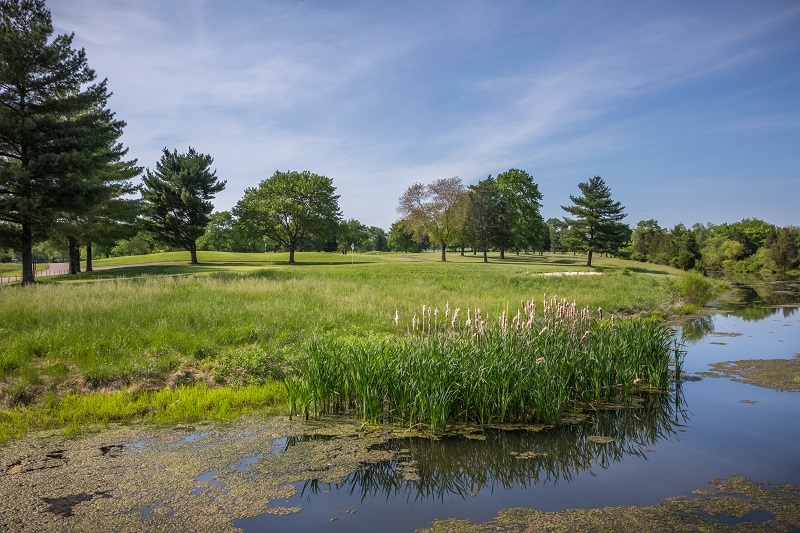 Properly designed golf courses capture rain and runoff in water hazards and stormwater ponds, providing most or all of the supplemental water necessary under normal conditions, though backup sources may be needed during drought conditions. Install berms and vegetated swales to capture pollutants and sediments from runoff before it enters irrigation storage ponds or other surface waters. Implement no- or low-maintenance vegetated buffer strips around surface waters. Utilize vegetated filter strips in conjunction with water filtration basins. Eliminate or minimize directly connected impervious areas. Use depressed landscape islands in parking lots to catch and filter water and allow for infiltration. When hard rains occur, an elevated stormwater drain inlet allows the island to hold the treatment volume and settle out sediment, while allowing the overflow to drain away. When possible, maximize the use of pervious pavements, such as brick or concrete pavers separated by sand and planted. 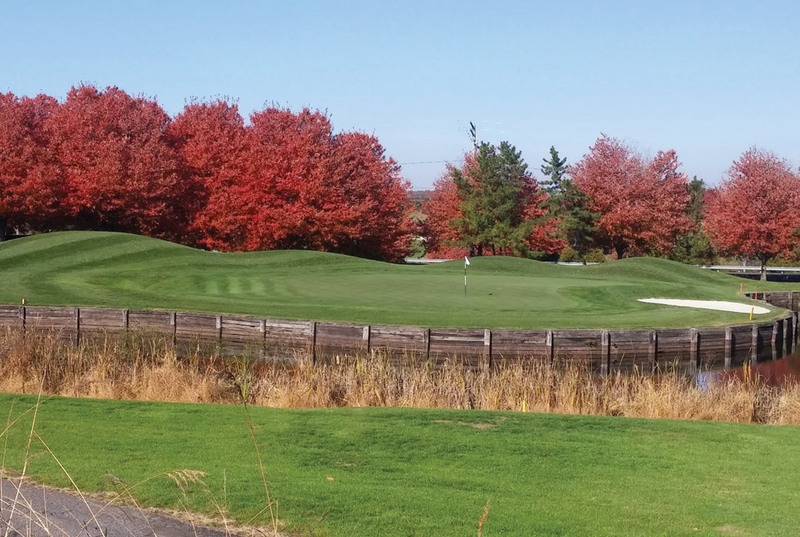 Stream buffers act as natural biofilters that protect surface water quality, such as the vegetated buffers at Poolesville Golf Course. Photo credit: Jon Lobenstine.